After over 600 surveys, four neighborhood design meetings and two meetings with immediate neighbors, we arrived at our first version of the site plan and submitted to the City of Atlanta for rezoning. This plan preserves and adaptively reuses the historic Masonic Lodge connected to a large public plaza. A historic house on Glenwood is also preserved and converted to office/retail to give a variety of scale. New construction at the Glenwood and Portland corners helps frame the street and hide parking while the height of buildings scales down to transition to the adjacent single family residential. Below are the illustrative images for this plan; to read more on our community engagement process that led to this design, please see community updates #1, #2, and #3. Despite being very close to final approval of this initial site plan, it became clear to us that the plan we had composed was risk-heavy in today’s market due to a large proportion of office/retail space and a relatively small proportion of residential space. This reality, paired with the arrival of a great opportunity to add a significant community benefit in the form of affordable housing, has led us back to the engagement table in order to accommodate these factors with an important revision to the site plan. We started this project by asking the community what they wanted to see on the site, and now we are triangulating that community-led plan with some necessary pragmatic changes to make sure the project is feasible to get built. For those continuing to stay engaged in our conversation about this project, we thank you once again for your time and constructive feedback. Even though we had already gained your approval at the January NPU-W Land Use and Zoning Committee, and at the January SAND and EACA meetings, we hope you will be available to join us at one of the upcoming SAND, EACA or NPU meetings in March, or better yet at a scheduled community design session on March 23rd, to help us settle on a final design. The revision we now pursue is an addition of residential square footage to accommodate 17 more residential units on the site. This will bring the total number of units to 42, up from the original 25 proposed. We seek this specific unit count because it is the minimum number needed to become eligible for a financing source which will create homes for working families with annual household incomes between $26,000 and $53,000. This program is one of the nation’s most successful affordability financing sources, with rigorous standards from design through property management. As our local housing market has soared in value, we have an opportunity to support the rare inclusiveness and diversity that exists here by providing housing for working families who want to remain in or join the neighborhood. This would be the first new affordable housing built in the area since Branan Towers in the early 1970’s. Of considerable importance, this addition of residential space will also reduce the risk profile of the project from an investment perspective by better balancing the mix of uses. Our re-engagement with community stakeholders is focused on exactly how to best accommodate the necessary residential space on the site, while retaining the most important components of the concept that respond to stakeholders and neighbors’ priorities and bring added value to the community. These include the public outdoor plaza, preserving the Masonic Lodge, a walkable approach to site and building design, a shared-parking strategy to minimize parking overload, and a robust and low-density buffer along the western edge next to existing single-family homes. There was a lot of feedback over the past few months about limiting the vertical height of the new buildings, as well as the horizontal size of them, in favor of a smaller-looking buildings. In response, we created four options which keep the majority of the original concept intact, while proposing different ways to spread the additional space across the Moreland side of the site, away from the single-family neighbors. We can also hide much of the additional space on the interior of the site, so that most of it is unrecognizable from the surrounding street fronts. The views below depict the general massing of the buildings for each option, as viewed from the surrounding streets. The addition of a fourth floor is necessary in a few locations, but we seek to limit or hide them as much as possible. This also prevents having to go to a fifth floor at any location. 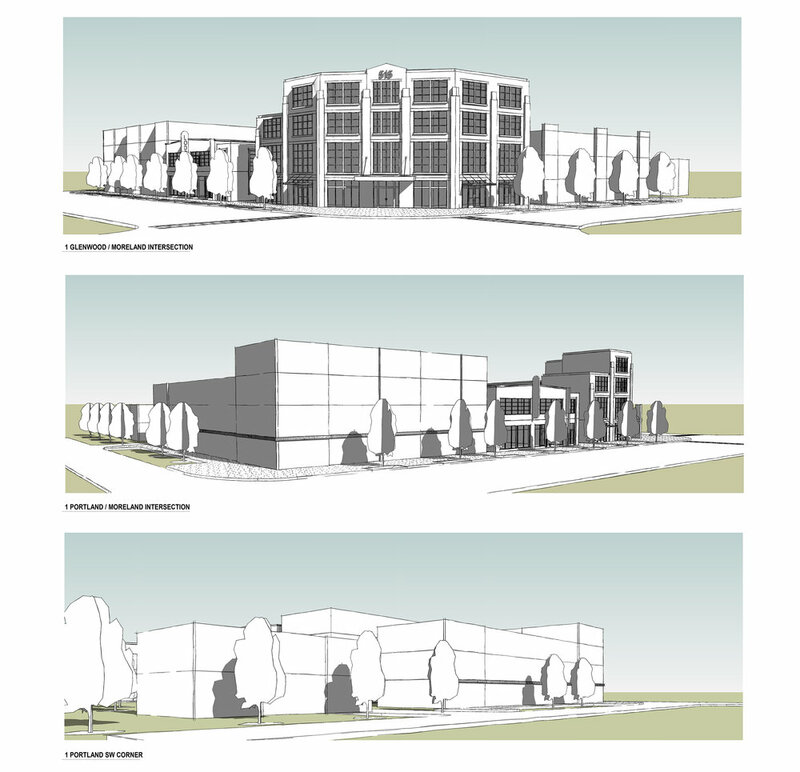 During a community design meeting on Saturday March 2 at which we presented these options for consideration, a fifth option rose as a combination of elements from the four. This Option 5, which responds to some immediate neighbors’ concerns and incorporates additional feedback recalled from earlier meetings, is where we would now like to focus attention. We very much want to hear your feedback about this plan over the next month, as we tweak and finalize the concept before returning to SAND, EACA and the NPU in April for final approval. The Option 5 site plan and views are shown below. In order to support the single-family residential character of Portland Ave., the Moreland face of Building E (corner of Moreland and Portland) steps down from 4 to 3 floors before reaching the corner. This keeps the Portland face a consistent 3 floors as originally proposed, and steps the scale down at the Moreland corner as well. The fourth floor is mostly hidden along the south wall of the Masonic Lodge. Building C (middle building on Glenwood) is four floors, adding some space with a short wing on its south side. The height impact is lessened because it faces a wider Glenwood Ave., and is across from a commercial property. The retained single family structure (Building B) helps shield it from the neighbors to the west. As with the other options, Option 5 requires a variance from the 35’ height limit within 150’ of the west property line. Buildings C and E both exceed 35’ by having four floors (approx. 44’) in some places, but this also allows none of the buildings to exceed four floors. It’s important to note that the public benefits of preserving the Masonic Lodge and creating a public plaza forces the project to spread the additional density throughout the site. 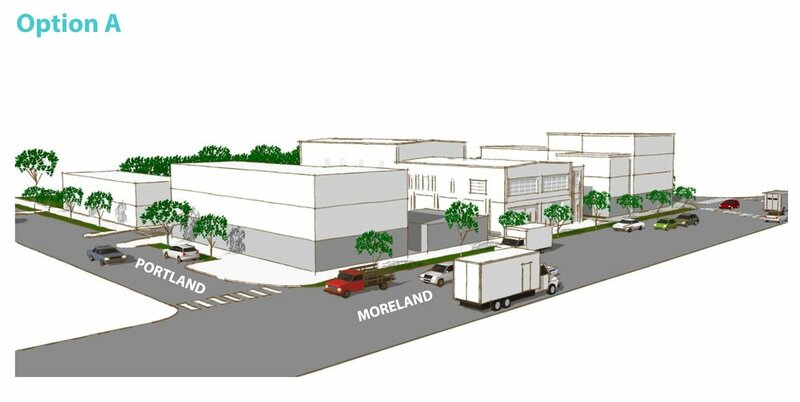 With this plan we are able to incorporate 42 affordable homes, keep all buildings four floors or less, retain the large public plaza, preserve the Masonic Lodge, retain the wide buffer next to single-family homes to the west, retain the office/retail use in Building D on the Moreland/Glenwood corner, and keep Building F on Portland at 2-1/2 stories as originally planned. Please join us at one of the upcoming community meetings to learn more and share your thoughts. We ran another parking analysis to understand the impact of 17 additional residential units on the shared-parking strategy we propose for the project. While market-rate homes typically require at least one parking space per unit, the effective parking use rate for affordable homes in locations with ready access to transit such as we propose is about 0.7 spaces per unit. After a closer look, we were also able to add four on-site parking spaces. As a result, although we would add 17 homes, the impact is minimal compared to our original plan, with only a 2 and 4-car increase in load at peak times. See a side-by-side comparison of the original and revised analyses below. We will then attend the same community meetings in April with a finalized concept, seeking formal recommendations of approval. Please come out and join us! Thank you once again for your continued interest in this project – with your help we are moving along. This update is a summary of the third community meeting we held on Saturday, November 17th at Ormewood Church. We received 183 responses to the initial design concepts survey. This feedback has been very helpful and we’re excited about how it has helped us improve the project’s potential as a neighborhood amenity, as a place to visit, and how it fits within the surrounding community. This third Community Update (first and second) provides a recap of the recent survey data and presents two revised design options for further consideration. These two options are the result of the integration of feedback we have received, an additional level of site design, and feasibility analysis. After the second community meeting on Nov. 3, we continued to gather input on the favorability of the (5) general concepts presented, asking respondents to rank each option on a scale of 1 (Not Good) to 5 (Great). As of Nov. 17, the results of the scoring are shown below. For more detailed descriptions of each option and to download high resolution files for these options, see Community Update #2. Least popular option with an average score of 2.10. 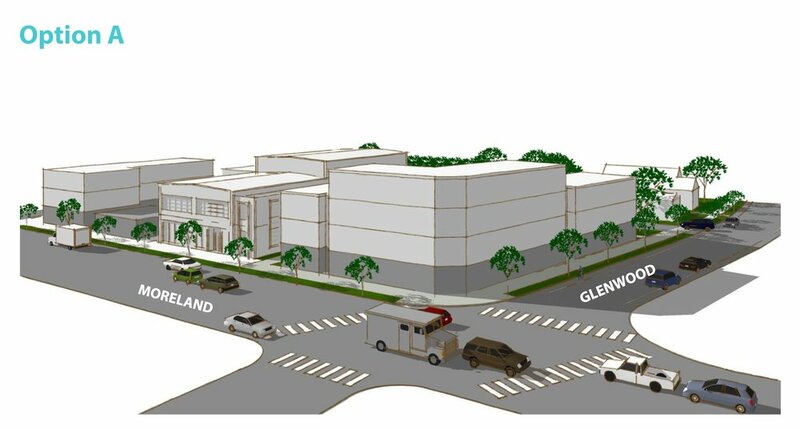 Comments showed a consensus about the undesirability of an unsightly parking lot on the corner of Glenwood and Moreland and not the highest and best use of the site. Combined 67.07% ranked this option at the bottom two stars. The most popular option, scoring 3.03. This option seemed to strike a preferred balance between framing the Glenwood corner with a prominent building, while keeping a moderate scale which blends in with the neighborhood. The bell curve scoring results reflect a higher level of consensus about this Option. Several comments expressed concern about having only one entrance, creating bottlenecks at Glenwood. Lower density option with a 2.84 score, tied for third place. This option gathered a lot of votes in the middle, but comments were highly polarized about the one-way access, repeating Glenwood bottleneck concerns expressed about Option 2. Higher density concept tied with Option 3 for third place at 2.84. The non-communicating (no access between levels) deck behind the buildings on the south side stops auto thru-access, but could also increase circle-around traffic on Portland. The 5-story building at the corner of Glenwood was somewhat polarizing, receiving strong dislikes and likes. This highest density option (also with structured parking) had the second-best score at 2.89, but was also the most polarizing. Option 5 had the highest amount of 5-star rankings and the second most 1-star ratings, behind Option 1. The high degree of density and significant amount of structured parking were the primary factors, driving strong favorable and unfavorable reactions. Our next step was to identify the top two versions with which to proceed, taking into account both the average score and the level of consensus/comments within the scoring. This resulted in the second round of designs, Option A and Option B, which were presented at our third community meeting on November 17th at Ormewood Church. Option A is the lower-density surface parking option and Option B is the higher-density structured parking option of the two. The progression of ideas and development of details allowed for more accurate financial analysis. We also followed up with GDOT to explore the possibility of site access for cars from Moreland (it is not a realistic option), and discuss other design issues relative to Moreland and Glenwood (both are state routes). With the next-level options now put forward, we have synthesized many various inputs, seeking to balance the community’s qualitative comments of wishes and concerns, good urban design, and financial feasibility. Both versions maintain our initial intent to preserve the Masonic Lodge. We also remain committed to the quality of public space in this project, reflected in the sizable public plaza next to the Masonic Lodge, and comfortable, effective pedestrian circulation across the site. Both options respond to nearby neighbors’ concerns about scale and cars. We also developed more detailed calculations for parking utilization, so that we can maximize a shared parking strategy (balancing daytime demand such as restaurants/retail with night-time demand like residential) and minimize peak parking overload. Charts are included on the Option images below. We will continue to assess parking supply and demand, including the mix of uses and off-site parking possibilities. We will likewise continue to design this project with pedestrians, cyclists, and families with children in mind. Both Options also require rezoning the four residential parcels to allow for retail/commercial and/or low-density attached housing. We will assess the best options and commit to incorporating conditions within the new zoning to ensure elements of transitional buffering and other development controls. Due to the high degree of polarization about density, auto access, and parking, we know that we cannot make everyone completely happy, but we genuinely seek to find common ground by proposing options which balance positive community benefits and financial considerations, while minimizing negative impacts. Option A takes the most popular initial design of Option 2 and further refines it to incorporate the qualitative comments received. By preserving an additional commercial storefront building next to the Masonic Lodge, the overall scale of the project steps down and embraces an ‘incremental urbanism’ approach with multiple smaller buildings. This also gives some visual relief to the Masonic Lodge by stepping down the heights directly next to the building, and along with the single family house preserved on Glenwood provides variety in scale. Stepping the height of the corner of the building at Moreland and Glenwood up to four stories allows for a prominent architectural statement fitting for the ‘gateway’ significance of that location, without fully intensifying the size of that building. The lower-density scale allows for a surface-parking lot, which has added benefits of a higher-quality pedestrian environment and the ability to preserve more mature trees along the western edge buffer. Option A also incorporates a controlled-access parking lot in order to prevent cut through traffic and deter excessive parking. We imagine this will be managed similar to the Sweet Auburn Curb Market parking lot, where patrons and guests receive validated parking, but anyone passing through or parking to visit elsewhere pays a fee. We will also incentivize alternative transportation by providing plenty of bicycle parking and shared shower facilities for the office tenants. The Shared Parking Peak Utilization chart shows the results of a ‘right-sized’ shared parking analysis. 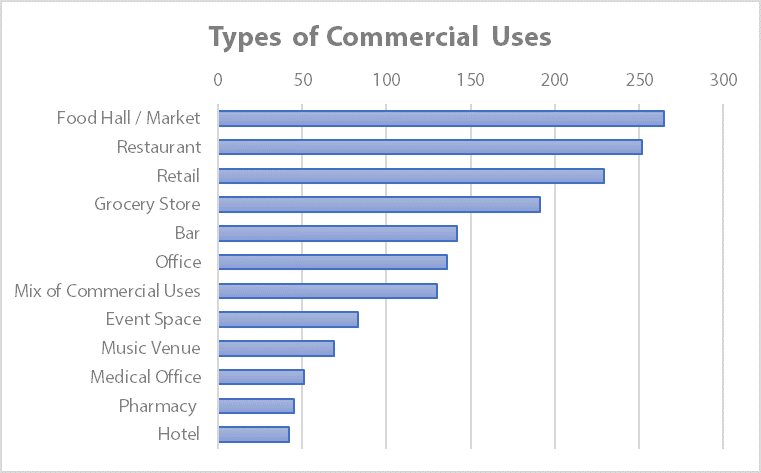 We applied data-based parking demand rates for the specific amounts of square footage per use (office, retail, residential) in this concept and applied that to the peak utilization times of each use. This allows for a more accurate understanding of actual parking demand during the course of the day, as opposed to the standard approach of simply adding up the required parking amounts for each use and assuming they would all be utilized at peak demand all day long. While the analysis shows peak demand mid-day exceeding supply, it does not account for shared patronization between uses (on-site office workers or residents visiting restaurants and therefore not requiring an additional parking space). We know this is an important issue, so we will continue to explore how peak supply/demand can be better balanced. The quality of the public plaza is also improved – more trees results in more shade, and lower temperatures on hot days. An active water feature will also help to reduce ambient temperature and provide some cancellation of the traffic noise from Moreland and Glenwood. Activation of the buildings at the plaza level will help to make the plaza a destination as well. 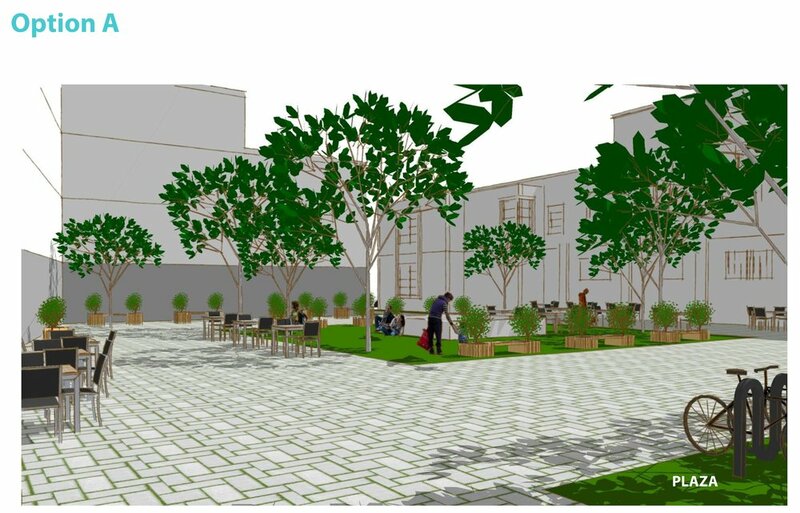 We intend for the plaza to be a pedestrian friendly gathering place, encouraging local residents to walk, bicycle and stroll to the project. Click the image above for a higher resolution file. Option B presents a modified hybrid of the previous Options 4 & 5, incorporating a slightly higher density than Option A along with structured parking. While the density of the original Option 5 is reduced to retain some sensitivity to transitional scale next to existing homes and total height along Moreland, the structured parking requires a higher density than Option A, and the higher amount of square footage responds to desires for more corridor-oriented development and support for future transit. Amenities and strategies such as directional access at Portland, a plaza (slightly smaller), protected street parking with bulb-outs along Portland (to slow traffic), and ample bicycle parking are present in this Option too. While hidden behind buildings, the parking structure is the dominant feature of this Option. It physically blocks cut through traffic and provides more total parking spaces, but it also takes up a large amount of space on the site, reducing the ability to save trees and interrupting pedestrian thru-ways. Despite its substantial cost, neither would it completely resolve the parking deficit, even in a shared-parking scenario (see Shared Parking Utilization chart below). A greenspace atop the deck is no longer feasible, due to cost implications and the necessity of a ramped structure for circulation purposes. A ‘green screen’ of climbing plants would be implemented along all exposed sides of the deck to soften its visual weight, and we think it could be partially submerged to reduce its total height above grade. The cost of the parking structure pushes the financial boundaries on the project despite the increased density. This could require a more universal and expensive paid parking policy than in Option A in order to offset costs. We will take a much closer look at the financing of this Option, and whether the increased financial risk is worth the limited benefits provided. Over the next few weeks, we will delve further into the feasibility studies of Option A and B to narrow down the construction pricing, marketability, and financing of each option. With all of the input gathered from the three community meetings and over 600 survey responses, we believe we are almost ready to move toward a formal development application. We will continue to meet with nearby stakeholders to explore ways in which this project can reduce negative impacts and promote positive ones. We will also continue to be accessible by attending the SAND, EACA, and NPU-W meetings for additional presentations, feedback and refinement, and through open comment on this website. To view a calendar of these upcoming neighborhood meeting dates, please click here. 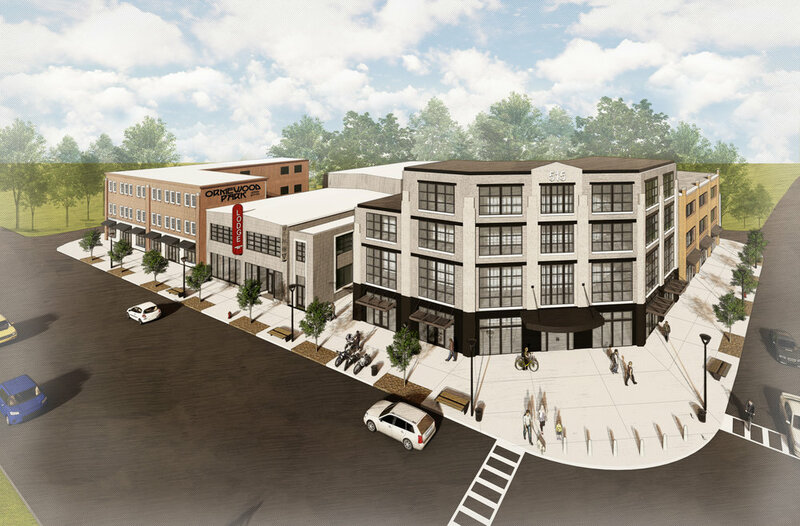 Our goal is to submit a rezoning application in early December to begin the formal review and recommendation process by the neighborhood associations, NPU-W and City of Atlanta. We encourage you to stay involved in this process to help see the project through. Thank you for staying involved in this project! We’d like to ask you about your impressions of our first progress designs to help us better shape a project supported by the community. If you haven't read our first Community Update, here is a link and below is an updated infographic summary of the first neighborhood meeting and over 400 surveys leading up to Meeting #2. This information helped inform our development goals and initial designs. Click the image for a higher resolution file. We then attempted to interpret this community feedback into the built form and presented 5 conceptual design options at the second meeting on Saturday, November 3rd at Branan Towers. After a background presentation on the designs, we broke out into an open house format to discuss the options and attendees were asked to place comments on each design. Now for the fun part! Below are the same presentation boards we shared with the neighborhood at the second meeting. Please review the information and then take our 5-minute survey to rate these concepts and tell us what you like and don't like about them. The ratings and specific comments will contribute substantially to our decision-making process as we work to narrow down and revise the ideas into more detailed feasible concepts for the next community meeting. Please note that the two shared-parking diagrams on each board are the same. They are the results of a general ULI study to illustrate how the project uses can share parking with different peak demand times. To download higher resolution images for better viewing, please click here. 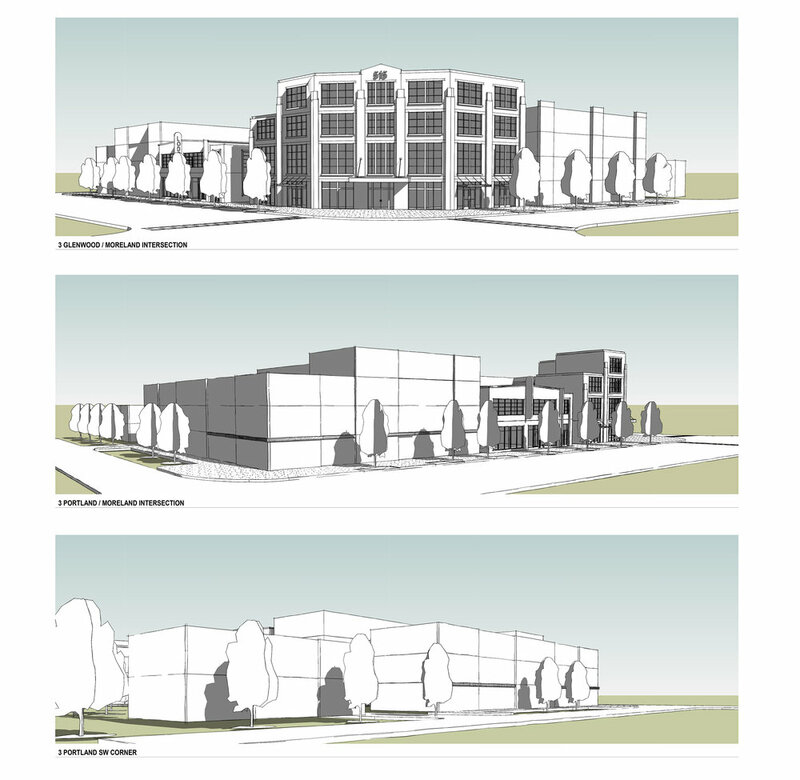 Option 1 is the base-case concept for the development as currently zoned. This would entail selling the four single family homes, adaptive reuse of the Masonic Lodge, and development of live-work units on the Portland corner. This option would require the Glenwood corner to remain a parking lot in order to have adequate parking for the Masonic building. Shared parking demand charts from the Urban Land Institute are included to help illustrate the different peak demands of the proposed uses. As with all options, street parking spaces with protective curb bulb-outs provide additional space for street trees and will help calm the speed of cars on Portland Ave.
Option 2 rezones the single family parcels and distributes parking throughout the site. This allows the development of a gateway building at the Glenwood corner that also frames a large public space. One house on Glenwood is converted to retail or office use. Building F is a transitional 2-story height next to the single family homes on Portland. The large amount of surface parking limits the buffer next to the homes on the west edge to the minimum of 20’. Pedestrian access and the quality of the public spaces are top priorities for all of the options. 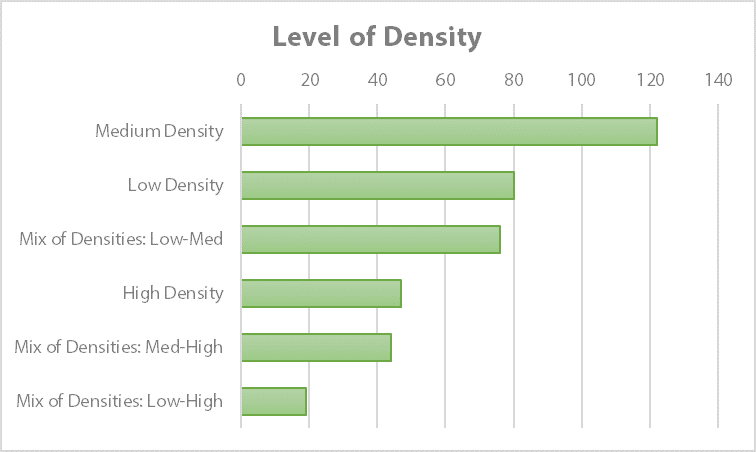 Shared parking demand charts from the Urban Land Institute are included to help illustrate the different peak demands of the proposed uses. Option 3 is very similar to Option 2 but utilizes a one-way ingress/egress throughout the site with angled parking which may help slow cars and reduce cut-through traffic on Portland Avenue. The narrower one-way lane also allows the public space to increase in size slightly over Option 2. Shared parking demand charts from the Urban Land Institute are included to help illustrate the different peak demands of the proposed uses. 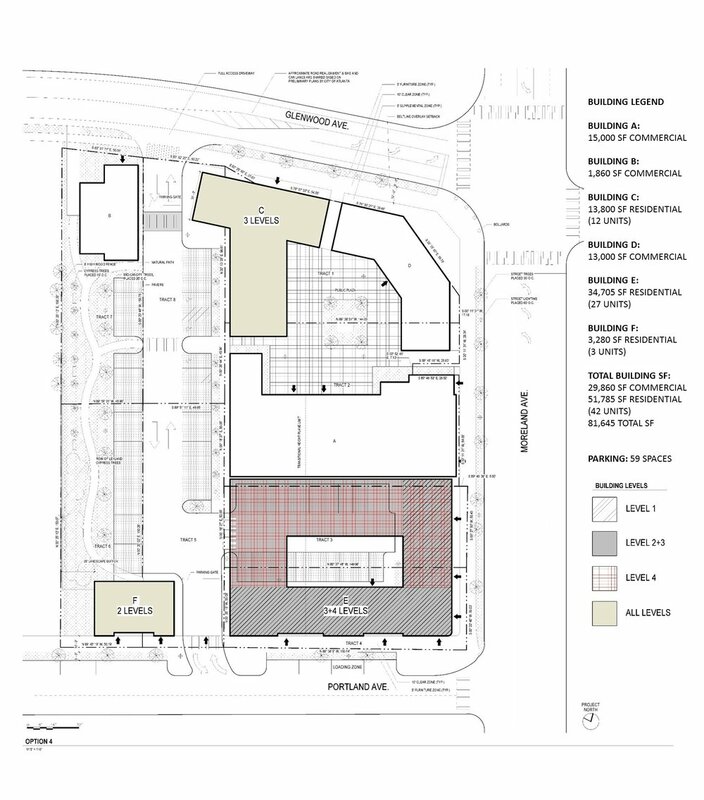 Option 4 utilizes some structured parking and has a slightly higher density with a 5-story building on the Glenwood corner and a 4-story building on the Portland corner. The cost of structured parking requires a higher density for the project to pencil out. The 2-level parking podium has no access between levels, which eliminates through-traffic. The Glenwood access side leads to the upper level of the parking podium; the Portland access goes to the lower level. Shared parking demand charts from the Urban Land Institute are included to help illustrate the different peak demands of the proposed uses. Option 5 utilizes a larger parking podium with a rooftop greenspace. The cost of the parking structure would require larger buildings with more leasable square footage on the site than the other options. This option provides the most parking spaces, but this also reduces the amount of ground-level public space. This 2-level parking podium also has no access between levels, which eliminates through-traffic. A slight drop in grade from north to south allows for the podium to be partially buried, with a reduced height above ground level. The Glenwood access side leads to the upper level of the parking podium; the Portland access goes to the lower level. Shared parking demand charts from the Urban Land Institute are included to help illustrate the different peak demands of the proposed uses. First, please take the 5-minute survey to rate these options and let us know what you like or don’t like about them. Next, please come to our next Community Meeting on November 17th, from 11a to 1p, at Ormewood Church (1071 Delaware Avenue SE). We will be holding a brief presentation at the beginning and then move to an open house format to present a couple schemes for the site based on feedback received on the first concepts. Folks can come and go at a convenient time, to provide us important feedback on those options which we will then use to further refine them. We’ll also have a sketching table for folks to share more ideas on paper. Check back here for updates on the progress of the project. You can also subscribe below to receive email notifications of new updates.